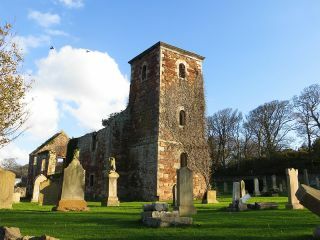 Old St Andrew's Church in North Berwick is a ruined 17th-century church with a striking west tower, noted as the burial place of John Blackadder, a Covenanter martyr. It is a bit difficult to keep track of historic churches in North Berwick. First, there was the Auld Kirk, located on a spit of land beside the harbour and dedicated to St Andrew. The promontory on which the church stood was devastated by erosion in the 17th century and the kirk collapsed, leaving only a tower. The Auld Kirk was made famous in 1595 when local women were accused of being witches, gathering in the kirk to listen to a sermon from the Devil, and plot to kill James VI and his new bride. A second St Andrew's church was built on Kirk Ports, south of the High Street, and opened in 1664. The rectangular church had box pews with galleries at both ends for leading families, and a pulpit midway along the south side. The west tower had a belfry, hung with a bell taken from the medieval kirk. The church was renovated in 1770 and again in 1819 when the interior stripped of furnishings save for the Dalrymple family pew. The second St Andrew's church remained in use until 1883 when a new parish church of St Andrew Blackadder was opened on the High Street. The second St Andrew's church fell into decay, and is now a rather forlorn, roofless ruin save for the west tower. The most interesting feature of the church is several historic monuments, including that of Rev John Blackadder. To modern visitors, the name Blackadder raises a snicker of amusement, but we're not talking about the comic character made famous by Rowan Atkinson here, but John Blackadder (1615-1685), a minister at Troqueer in Dumfriesshire and a martyr to the Covenanter cause. Rev Blackadder came out publicly against the practice of appointing bishops in the Church of Scotland and was thrown out of his parish by the authorities, He preached widely across Scotland, drawing large crowds to hear his open-ar sermons. Blackadder was arrested for illegally preaching in the open air and imprisoned on Bass Rock, where he died in 1685. Since Bass Rock was officially n the parish of North Berwick at the time, Blackadder was buried in St Andrew's churchyard. Blackadder became something of a celebrity during the upheavals that led to the Free Church of Scotland splitting from the Church of Scotland in 1843. When the United Free Church of Scotland and the Church of Scotland merged in the 20th century, the combined parish was called St Andrew Blackadder, which might be a bit confusing if you don't know the background! Location: Just off the A198 on Kirk Ports.